Springshare gets nostalgic – it’s our 5-year anniversary! Five years ago, George Bush was president, the Writers Guild of America went on strike, Steve Jobs announced the first generation iPhone, and a library-loving company called Springshare came into being. What a long way we’ve all come since then! As you can tell, we’re feeling a little nostalgic on this, the 5-year anniversary of the first LibGuide. Sadly, that guide has since been retired, but like all nostalgic people, we enjoy looking at snapshots through the years – and we thought you might too! 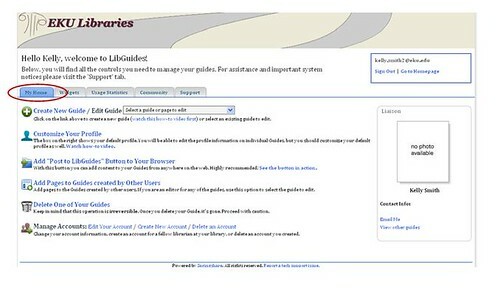 Here’s the first iteration of the LibGuides home page – thanks to Michael Stephens for sharing this image! The admin page, circa 2008 – thanks to Kelly Smith at Eastern Kentucky University for this one! And we saved the best for last – an old 404 message, shared by Elizabeth Brixton. Just so you know, it’s really Slaven’s fault. We’ve come a long way in 5 years – from one guide to almost 250,000 (whoa! ), and from a handful of librarians to over 44,000 (double-whoa!). Many thanks to all of you for being part of the Springy community – you guys never cease to amaze, educate, and delight us. And wow, time really does fly when you’re having fun!